Happy 2015 and welcome to my first book review of the year. The Art of Social Media by Guy Kawasaki and Peg Fitzpatrick consisted mostly of social media tips and was an easy read, with a lot of scannable content for those so busy doing social media that they probably barely have time to sit and read a book about it. 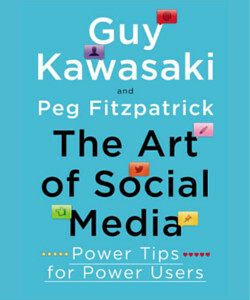 I had of course heard of and heard Guy Kawasaki speak in person, but had never heard of his co-author, Peg Fitzpatrick, which did give me pause...if she was such a social media influencer, why had I never heard of her? (I'd be curious if others had heard of her before reading the book.) I do think name recognition important in this context. While there were some valuable tips overall, I was a bit surprised that the book completely ignored important trends in online visibility, such as: brand ambassadors, Snapchat, Vine, Instagram video, podcasting, and other video platforms outside YouTube, such as Vimeo. The discussion of blogging could have been more substantive through at least a brief description of the various blogging platforms out there, and the suggestion to guest blog for places like Huffington Post and Hubspot probably not realistic for most of us, who are not as connected as the authors. I was also surprised that the discussion of YouTube was rather cursory, with no mention of hugely important tools such as annotations, geotagging, etc., and the suggestion to create a channel trailer, which is pretty common knowledge. I was also disappointed that the LinkedIn section was rather superficial. Most of us know to customize a request to connect and not use the default language LinkedIn provides, as well as the importance of connecting with Groups. Visually, I found it odd that the book was full of underscores representing hyperlinks, but obviously if we are reading the hard copy this isn't going to happen, so why not do readers a favor and include the URLs in parentheses for us to look up on their own? It was also difficult to read the small screenshots meant to illustrate specific points. On the positive side, I ended up with about 10 action items as takeaways, most related to Pinterest, with fresh tips on the arrangement of boards, use of public vs private boards, etc. But overall, the book could have been a more dynamic and compelling read.